Lebanon, Missouri has long been home to an oft-traveled trail along the edge of the Ozarks, beginning when the Wyota and Osage Indians roamed the area. During the Civil War, the trail became known as the “Wire Road” because of the telegraph lines installed along it between St. Louis and Springfield. Then, in the late 1920s, Route 66 was born and roughly followed the same path the Indians had marked. Today the “trail” is called I-44. The first white settler in the area was a man named Jesse Ballew in 1820, who built a log cabin on the east side of the Gasconade River. 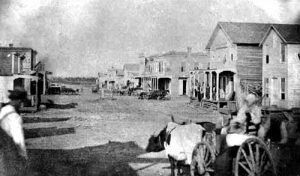 When Laclede County was formed in 1849, the settlement of Wyota, named for the area Indians, became the county seat. 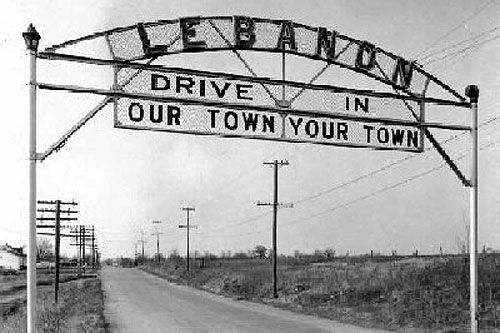 Later a highly respected minister requested the name be changed to Lebanon, after his hometown of Lebanon, Tennessee. Soon, a courthouse was erected on the town square of the newly formed county seat. Early settlers were mostly hunters and farmers from Tennessee, but word soon spread about the region, its rich farmland, plentiful game, rivers, and springs, and people from the east began to migrate to the new settlement. In the 1850s The Academy was built, which offered higher education to the area’s students and soon became the center of the town’s cultural activity. By the time the Civil War began, Lebanon remained a small secluded settlement. Though Missouri declared itself as a neutral state, its population was primarily from the South and therefore sympathized with the Confederate forces. During this time, Lebanon saw division among its people, even among families. In the 1860 election, Abraham Lincoln had received only one vote. The Lebanon people obviously did not consider themselves “neutral.” The town was occupied by troops for the entire length of the war. Except for six months in late 1861 when the Confederates were in control, the occupation was by Union troops. When the war ended, the town worked together to rebuild the community and officially incorporated in 1867. When the railroad began its expansion west, the short-sighted town of Lebanon refused to provide land for a railroad depot. As a result, the railroad tracks were built one mile away from the existing settlement. Later the commercial area of the town moved closer to the railroad, and the original site became known as Old Town. Eventually, even the old town square disappeared. In 1882, the Lebanon Opera House opened and along with other buildings in town, helped to establish the town as a popular place to gather for meetings. Then a discovery was made in 1889 that helped to attract even more visitors to Lebanon. When water well was dug for the community, they discovered that the water had magnetic properties. The locals began to drink and bathe in the water, believing that it had healing properties. The magnetic water led to the building of the Gasconade Hotel, the grandest structure ever erected in Lebanon. Having the capacity to house up to 500 guests, the hotel also provided a ballroom, restaurant, reception rooms, and a bathhouse next to the magnetic well. 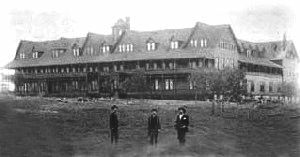 Sure that people would flock from all over the country to partake of the healing waters, its builders were sorely disappointed when the hotel was not successful. Soon it became and sanatorium, but that was also short-lived. Next, it was used for community events and there was talk of turning the beautiful structure into a college. However, just ten years after it was built, the Gasconade Hotel was totally destroyed by fire in October 1899. Lebanon continued to thrive as a small community, catering to travelers along the edge of the Ozarks. But the town really saw a change when Route 66 was born in 1926. Lebanon, the largest town between Rolla and Springfield, Missouri became a major stop along the Mother Road. Quickly providing road services, one of the first motels along the highway was Camp Joy, which opened in 1927 as a tent camp at a rate of 50 cents a night. Later, cottages and a combination gas station/grocery store were added. The Spears family ran Camp Joy for 44 years in Lebanon and even named one of their daughters after the business. 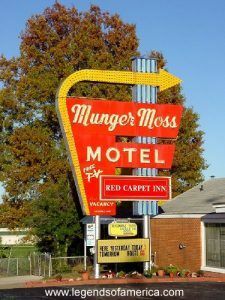 In 1931 Arthur T. Nelson built his 24-room hotel at the intersection of Route 66 and Missouri Highway 5. The Nelson Hotel and Dream Village soon became one of the best-known spots along Route 66 between Chicago and Los Angeles. Each room featured a private bath and kitchen facilities, renting for $2-$3 a night. Across the street from the hotel, Nelson built his “Dream Village,” so named because the layout appeared to him in a dream. Twelve units of native Ozark stone surrounded a courtyard which featured a very special fountain. In the evenings it became the centerpiece of a light and music show. Cars would be lined up for blocks to see it. Nelsonville, as it was called by the locals, passed into history when Route 66 became I-44. Route 66 in Lebanon was also was the site of some interesting restaurants. Perhaps the most unique was Andy’s Street Car Grill. It was housed in an actual street car, brought in from St. Louis, and its featured dish was “Andy’s Famous Fried Domestic Rabbit.” Alas, Andy’s is long gone. Up until just recently, you could still get a great plate of home fixins from the Bell Restaurant; but, unfortunately, it too has closed. 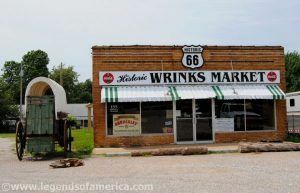 Another Lebanon landmark along Route 66 is Wrink’s Market, which opened in June 1950 and continued to operate up until owner, Glenn Wrinkle’s death in March 2005. This was a one of kind vintage market, where you would not only see groceries, but also collectibles, dry goods, and Route 66 memorabilia. However, the main attraction was always Glenn Wrinkle himself, who could astound the Route 66 traveler with his stories covering more than a half a century along the Mother Road. Alas, the road lost yet another paragraph in its history when Mr. Wrinkle died in March 2005 and the family auctioned the contents of the store. His son briefly resurrected the market as a convenience store, but, it closed in 2009. Located in south-central Missouri on the edge of the Ozarks, Lebanon straddles Interstate 44. Today this small town of some 12,000 souls, though nestled among flowering trees, cool streams, and rolling hills is growing quickly. Still though, wonderful peeks of vintage America can still be found among the thriving franchise operated strip malls and hotels.